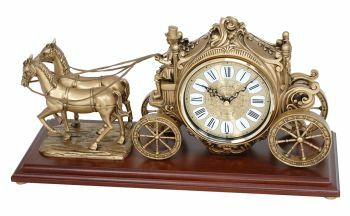 RHYTHM continues to design some of the most exquisite mantle clocks in the world. The "Buggy" is molded from a high-grade premium polyresin. The carriage of the piece displays an elegant Roman numeral dial that is driven by our signature RRS movement that plays one of 28 melodies. Clock is battery quartz operated.